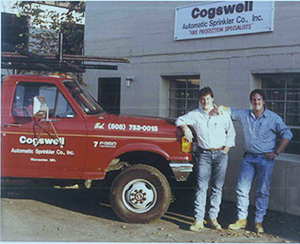 ABOUT US - COGSWELL SPRINKLER CO. The Cogswell Sprinkler Company Inc.(CSC) has been engaged in the business of designing, inspecting, maintaining and installing fire sprinkler systems since its beginning over 30 years ago. 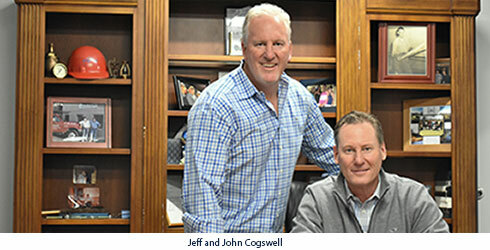 CSC was founded by Jack Cogswell with his sons John and Jeffrey on the basic principal that absolute service and dedication to their customers was the most critical commitment they could make. It assured their success then, just as it assures it today. With ever changing conditions in the fire protection arena, CSC has grown horizontally as well. New divisions have been created over the years to facilitate the challenges and further commit the solidly entrenched philosophy of "Customer Service Comes First". With the need to respond to the challenges in front of them, The Cogswells developed a growth strategy which today includes specific divisions dedicated to diverse markets such as Residential, Fire Alarm, Special Hazards and Specific Applications. It was these expansions that necessitated the use of the already established entity, The Cogswell Companies, to demonstrate the broad range of product offerings. From High-rise to Homes, Industrial to Institution.the Cogswells have grown to meet the challenges placed upon them. The list of projects and business partners speaks for itself. There has never been the "too large" or "too small" response to a customer in need of a life and property saving fire sprinkler system. Recognizing that no company is an island, the Cogswells invested in the fire sprinkler industry from the beginning by actively participating in Fire Protection associations. Giving back to the Industry that gave them so much was an easy decision. Association involvement assures their customers that the most current training and technology available is always considered by The Cogswell Companies. We invite you to join us in our quest for excellence. Being in the Life Safety business allows nothing less. We invite you to partner with us as we head into our next 30 years of a proud and professional American success story.